Like millions of other people in America, I took the opportunity to watch The Wolverine, over the weekend. If you have been living under a rock, you won't already know that The Wolverine is the second installment of the back-story behind Marvel's Wolverine character from the X-Men franchise. For some strange reason, I feel compelled to state that fact before proceeding with the review. I don't actually believe that Stationary Waves readers live under rocks, but it feels as though I haven't fully covered the topic unless I state the most elementary facts. The Wolverine tells the story of an emotionally scarred and hermitic Logan, haunted by the nightmares of his troubled past and sworn to a life of peace and isolation. One day, Logan meets Yukio, a Japanese mutant girl who can see the future. Yukio tells Logan that she works for a wealthy Japanese man, Yashida, whom Logan once saved from the atomic detonation at Nagasaki. According to Yukio, Yashida is now on his death bed and wants the chance to personally thank Logan for saving his life. Logan reluctantly agrees to travel to Japan with Yukio for Yashida's sake. When he finally meets Yashida, Logan learns that Yashida's scientists have discovered a way to transfer Wolverine's self-healing powers from Logan to Yashida himself. Yashida reasons that, since Logan wants to die while Yashida wants desperately to live, this presents a unique opportunity to both of them. Logan refuses the offer, but before he can return to Canada, in true Wolverine style, all hell breaks loose. 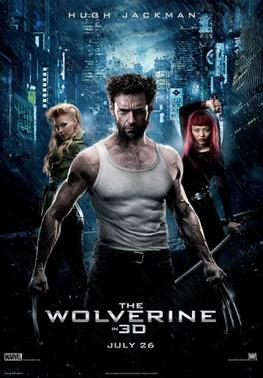 The Wolverine definitely falls victim to a little cheesiness, but this is helpfully kept at by by the demands of the plot, and also by a thrilling soundtrack that, to my memory, never degenerates into a pizzicato pentatonic appeal to the worst kind of stereotypes. And while there are plenty of ninjas and Yakuza in the movie, their role is not so central to the plot that it takes over. At its core, The Wolverine is true to the central, underlying plot of every X-Men movie: mutants, the humans who hate them, the humans who envy them, and the humans who see them as people. Comparisons to 2009's X-Men Origins: Wolverine are inevitable. That movie set the bar for all superhero movies that have followed in its place, and remains one of the best of the genre four years later. Does the new movie equal the 2009 film? Certainly not. I would encourage viewers, however, to see all of these Marvel movies as thematically intertwined, but each a stand-alone film - not unlike the comic books themselves. True, the purists will always tend to roll their eyes at anything that fails to equal their most beloved story lines, issues, and films. But this is part of the fun of being an enthusiast. At the same time, that which is not "the best" can still be entertaining and worthwhile. So it is for The Wolverine, which packs a mighty wallop despite its ultimately falling short of the kind of rarity that its precursor was, and it further propels the Marvel universe forward on the silver screen. But I may be a little biased because I have yet to see a Marvel movie I didn't like.